A three-dimensional cutting machine, specified for cutting all the same flat dice and flat strip cuts as the Urschel model G / G-A, but also capable of crinkle dices, crinkle strip cuts e.g. for krinkle cut french fries; accepting product input sized up to 5.5 inches (140mm) in any dimension. Manufacturer recommends for uniform dices, strips, and slices from a variety of soft ripe fruits and brittle root vegetables, such as potatoes, beets, lettuce, cabbage, broccoli, cauliflower, sweet potatoes, squash, carrots, mushrooms, turnips, cantaloupe, endive, tomatoes,cucumbers, horseradish, apples grapefruit, citrus peel, papaya, pineapple, peaches, celery, rutabagas, melon rind, and many other foods; producing clean, uniform, high-quality tons-per-our output. Slice thickness is hand-wheel adjustable from 1/8 inch (3.2mm) to 3/4 inch (19.1mm). Crosscut knife spindle (change part) - available in spacings from 9/32 inch (7.1mm) to 7/8 inch (22.2mm). Circular knifes can be spaced from 3/32 inch (2.4mm) to 3 inches (76.2mm). 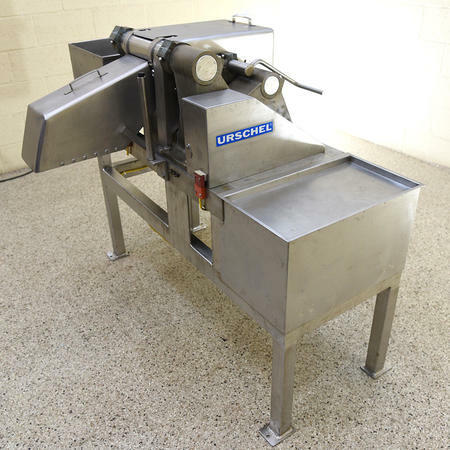 By removing the crosscut knife spindle and / or the circular knife spindle(s) , the Urschel HA dicer can also make juliennes and strip cuts (two-dimensional cuts) such as for flat or crinkle-cut French fries. Food grade sanitary stainless steel product contacts. Stainless steel shrouding, frame, knives and cutting spindles. Stainless steel slice shell and impeller. 10 inch slice shell opening. 208/230/460 volt 3 phase drive. As of this writing, this refurbished Urschel cutter / dicing machine is in stock at Alard, in good operational condition, available for immediate shipment as-is, or can be refurbished to excellent condition to include replating of main casting and spindle arms, for timely shipment. This page contains a single entry by Michael C. Shults, Alard Equipment Corp published on November 19, 2018 11:29 AM. HEAT INDUCTION SEALING MACHINE, 1kw or 2kw, Y3921 was the previous entry in this blog. Burt 704 roll-thru LABELER video demo, Y3877 is the next entry in this blog.